When visiting Fayles Library, I was immediately drawn to Tehching Hsieh and his work as a performance artist. 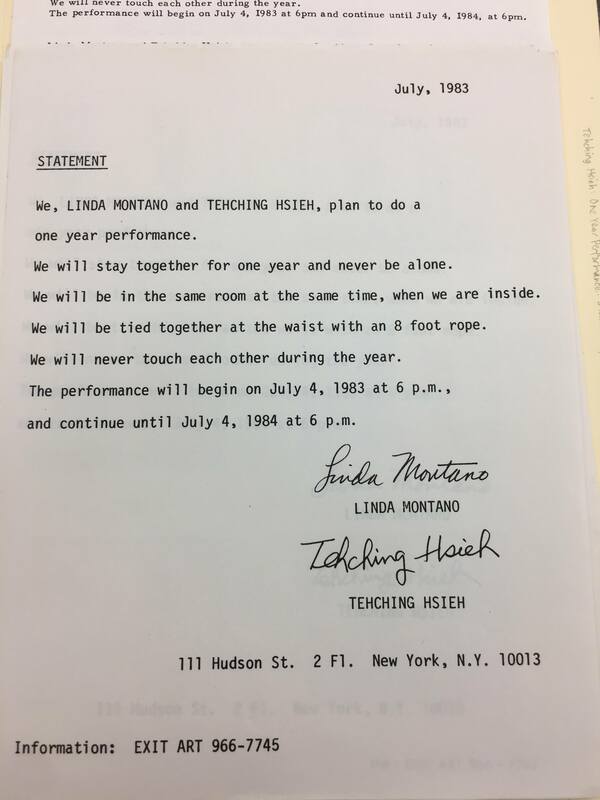 Most specifically, I decided to take a closer look at Hsieh’s “One Year Performance (Rope Piece)” in which he was physically tied to Linda Montano for an entire year, only separated by an eight-foot rope. This single artifact was enclosed in an entire folder of Montano’s letters and notes detailing her own experiences and struggles within the piece. Yet, the original copy detailing the performance was what stood out to me. The official statement reads the details of the art piece, specifically that they “will never touch each other during the year”. It outlines the starting date of July 4th 1983 at 6pm, and ending date of July 4th 1984 at 6pm. It was simple, typed up in black ink from a typewriter. Basic and mundane, hinting at the underlying concept of the mundane that is prevalent throughout all of Hsieh’s work. 365 days tied to the same person—always with them, but never touching. It’s important to begin with Hsieh’s art performance as a whole, and the ways in which he challenges others to view everyday activities in a new light. Coming from “Taiwan as an illegal immigrant in 1974”, Hsieh was immediately thrown into the energy and speed of New York City (Cotter). While this is a city of wonders and rare finds, Tehching says that “his performances are not about endurance, or discipline, or spiritual conditions but about everyday life, which is made up of repetitive patterns” (Cotter). As he focused his performances around one year, this art piece centered around the everyday pattern of being with people in New York. He lived outside on the streets of New York for a year, spent a year punching an alarm clock every hour, spent a year confined in a room. Having an entire year to experience and become a piece of living art, there is a strong feeling of repetition and emotion tied into these performances. When beginning my research on the One Year Performance with Linda Montano, I was quickly engrossed with literature about 1980’s performance art. Performance spaces and pop-up galleries became quite popular during this time period, providing artists with a lack of financial stability or support a place to show their work to the public. Apartments and clubs transformed into galleries and open spaces overnight. Most specifically, the Franklin Furnace provided a key space for artists in the 1980s (Carr 19). However, these spaces are unlike the glossy, white galleries that fill Chelsea today. They were described as “looking like the ordinary basement…with exposed pipes [and] clip-on lights…with 75 people on hand-folding chairs” (Carr 19). Most specifically, Furnace supported Hsieh by providing him with the ability to advertise and promote his pieces. For his One Year Performance (Outdoor Piece) in which he lived outside, Furnace provided him with photography and promotional materials to spread the word about his endeavors and promote him as an artist. These spaces have dwindled over time, but performance art took over the 1980’s and forced New Yorkers to pay attention. Art wasn’t limited to inside walls anymore, but stared blatantly in the eyes of New York’s inhabitants. The concept of space itself within 1980’s art is extremely important. Other prominent aritsts like Jenny Holzer and Keith Haring were unconventional in space as well. Subway tiles, building facades, and blank walls were now open spaces for artistic interpretation and creation. Art was not confined to four walls, but opened up to New York City in its entirety. While the 1980’s thrived on this new, experimental art scene, we continue to see this influence today. I think of the massive mural on Bowery and Houston, continually changing with politically influenced murals and new artists. We see contemporary examples like Banksy, shifting art from something you can purchase to something that is free, visible, public, equal. New York’s art scene, inspired by these experimental artists of our past, still continues to challenge the inequalities within art, and pushes equal access for all. As my artifact included the address where both artists would live over the course of the year, I felt inclined to analyze the location itself and how that ties into the networks and archeology of the city. 11 Hudson Street is situated in Tribeca, pushed away from the art scenes of the village. Tribeca was yet to become the family-oriented, luxury living that it is today. According to a 1985 article in the New York Times, Tribeca was “a swath of the very new kind of New York, with all kinds of avant garde art galleries and performance spaces like the Franklin Furnace to the Puppet Loft” (Yarrow). It was a place of artistic expression and freedom, something that seems to have shifted North into the village today. There was an influx of artistic talent, which the article highlights through it mentioning of “of some of the most successful artists and performers of the 80’s -the area’s residents include the performance artist Laurie Anderson, the painter James Rosenquist, the singers Bette Midler and Cyndi Lauper, the director Martin Scorsese and the actress Meryl Streep” (Yarrow). 11 Hudson Street itself, briefly mentioned in this simple artifact, carried much more social and artistic meaning than meets the eye. This avant garde performance piece becomes more intense when discussed in conversation with the speed and atmosphere of New York City as a whole. One is constantly surrounded by others and never touching, yet it’s so easy to bump into someone on the street. There’s an entire juxtaposition between feeling isolated or disconnected, yet living in one of the most populated cities in the world. We’ve discussed this perplexing feeling quite a bit throughout our class discussions, but this is something that Hseih and Montano touch upon throughout their Rope Piece. Quite quickly, they realized they were not very fond of each other. Hsieh shared in a 1983 interview that they argued frequently, yet notes that “this piece is about being like an animal, naked” (Kim). “We cannot hide our negative sides”, he states, as “it’s more than just honesty, we show our weakness” (Kim). Do we get annoyed and upset by being with people 24/7? Does the constant influx of people and oversaturation of bodies within New York force us to be vulnerable or does it push us to be tougher and stronger than we may be? The intimacy of being attached to someone for an entire year forces this vulnerability, to openly portray our weaknesses—all strong ideas demonstrated throughout a single performance piece on the second floor of 11 Hudson Street. Carr,C. “The Fiery Furnace: Performance in the ’80s, War in the ’90s.” jstor.org. Accessed March 24, 2018. Cotter, Holland. “‘The Third Mind: American Artists Contemplate Asia: 1860-1989’ at the Guggenheim.” latimes.com. Accessed March 24, 2018. Kim, Demie. “The Performance Artist Who Tied Himself to a Woman for a Year..” artsy.net. December 17, 2017. Accessed March 24, 2018. Yarrow, Andrew L. “TRIBECA, A GUIDE TO ITS OLD STYLES AND ITS NEW LIFE..” nytimes.com. October 18, 1985. Accessed March 24, 2018.